Not surprisingly, considering it’s embedded in everything we do; communication is a vital skill of an effective coach. Whether it’s delivering technical expertise and strategies, portraying coaching competence, developing team relationships, building respect and trust, or building and maintaining relationships, communication is crucial. A coach might set the standard for communication, but it’s important that all players understand the important principles behind effective communication. Athletes of all abilities and ages, across a variety of sports often highlight the importance of communication in achieving a positive and effective coach-athlete relationship. 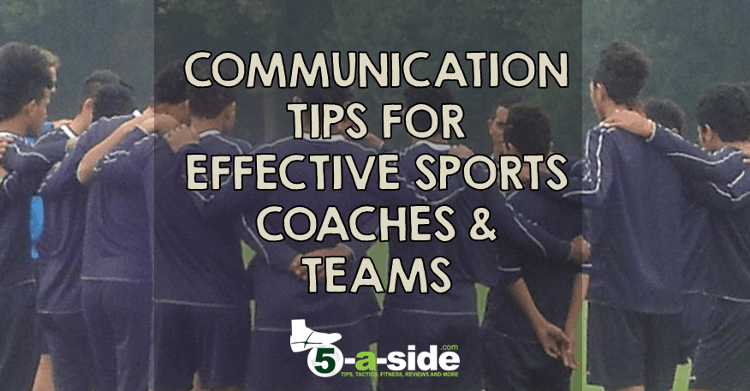 But how do you communicate effectively as a coach, as a player and as a team? It all starts by appreciating some key principles of communication. Understand these and you can raise your own levels of communication, and help an environment of healthy communication to flourish within your team. In this article we’ll look at some important areas to be aware of when it comes to communicating as part of any team. What follows are communication tips for coaches and players that have been expertly provided for this site by the Sport & Performance Psychologists at Primal Vision (for more detail on these guys – see the info at the end of the article). Bonus: We’ve covered a lot of practical aspects to effective team communication in a separate article: Essential Communication Skills for Your Team. If you want to see some practical examples of communication, read quotes on communication from sports legends like Alex Ferguson and find out where you are on the communication scale, you need to check out that article. Everything we do or say can be considered as a form of communication. Via the decisions we make and behaviour we exhibit, our actions, or lack of them, speak volumes. Be it the spoken or written word, or through our body language and facial expressions, our everyday social exchanges are often shaped by numerous factors, such as: our personality, gender, age, environment and the type and level of sport in which we take part in. It’s important to remember, communication is inevitable and once it’s out there, you can’t take it back. Additionally, don’t forget that all communication is open to interpretation and can be interpreted in a totally different way as to how it was meant – communication is a complex beast! The “meaning behind the message” can often be misunderstood; the subtle cues that give the meaning to what is being said: the tone of the voice, the context of the language used, the facial expression, the timing and type of feedback given, all need to be considered. The way in which a player communicates with her team mates will likely be different to how she communicates with her coach or manager – the tone and language you use will often need to be adapted, depending on the individual you’re engaging with. All communication contains the “What”, e.g. the technical and strategic element needed for the sport, but more importantly is the “How”. The “How” or “the meaning behind the message”, as mentioned above, provides the opportunity for trust, mutual respect, support, self-awareness and empowerment to occur and develop between individuals and the team. The ‘what’ is important to get across clearly, but it’s the ‘how’ that can really help. Relationships evolve over time and negotiating that evolution is common practise – it’s vital in order to maintain an effective working relationship. As athletes and/or the team progress and grow, an increased self awareness develops and individual motivations and goals can change. Coaches need to learn how to adopt a more supportive, leadership style in order to balance this growth and encourage their athletes to engage. For example, promote problem solving activities, involve the team in the decision making and feedback processes and reduce the amount of pressure and level of control. Provide your team with alternatives, and offer clear explanations as to why certain decisions have to be made. Acknowledge and try to understand everyone’s opinions. Conflict is to be expected in any relationship, but how that conflict is managed and/or resolved is essential to the continuation of an effective and successful working relationship. Most importantly, it’s management and/or resolution is a mutual process. Most people assume that conflict is negative; however, it can actually be positive. Through the promotion of constructive discussion and exploration of problem solving, conflict can in fact help increase self awareness and social skills, such as negotiation and listening and can support the continued development and growth of team goals. How a Coach handles conflict, also impacts the team. If the Coach can competently tackle team conflict, through the clear clarification of individual roles, clear explanations as to what the athlete/team needs to do in order to progress, whilst listening to and empathising with the team, athletes are more likely to be receptive and respond positively to Coach feedback. Be aware: it may not be possible to completely resolve conflict and actually, that’s ok. What is important however is how it’s managed. 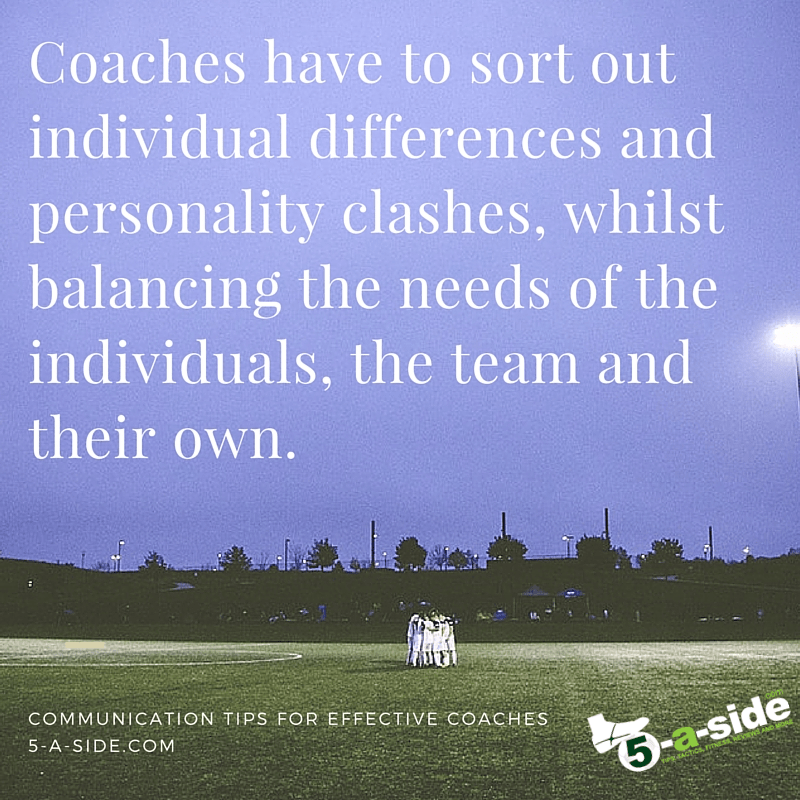 Due to the nature of their role, Coaches will continuously find themselves having to facilitate the communication between their athletes and the team, to sort out individual differences and personality clashes, whilst balancing the needs of the individuals, the team and their own. All members of the team, but especially the Coach, should aim and be open to, developing their communication expertise. Mastering communication skills is vital for team cohesion and subsequently, the success of the team. Areas to consider and develop should include: the ability to engage and create positive and effective connections; proactively develop and empower all members of the team; increase the level of self awareness and objectivity and express a genuine care and concern for all members of the team. Want to know more: Read our guide to the Essential Communication Skills for Your Team. This practical guide includes examples of communication, quotes on communication from sports legends like Alex Ferguson, and a useful tool (‘the Communication Scale’) which will help you assess your communication effectiveness. Just as you would continuously train to improve your strength, conditioning and fitness and spend hours perfecting techniques and set plays, regularly training your “mental game” is just as important and is a vital component in enhancing and improving your competitive mindset. 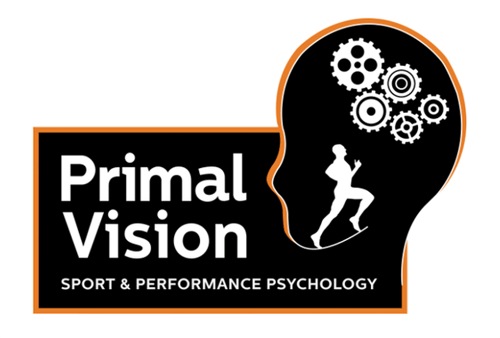 At Primal Vision we offer a variety of services to support any sporting individual. Whether you’re a professional athlete, an amateur team, aspiring coach or just looking to kick start your own health and wellbeing journey, we’ll support you from start to finish. We’ll provide you with a personable and professional service, completely tailored to your needs to help you strive towards and achieve your own personal sporting success. Contact us today to discuss your personal requirements and to find out how we can help you achieve your own Primal Vision. Very well said and elaborated. It is true that every player should maintain cordial and healthy relationship with his or her coach. It is important because your coach is the only person who will find the best in you and nourish it properly. It is indeed a must read for all the players and coaches these days. Hi Ashley, well said. A good coach will bring the best out of you and that will only happen if lines of communication are open. Same goes for your teammates. Thanks for the comment. I like this article, what is the name of the person who wrote it? Glad you enjoyed it.Leanne, from Primal Vision wrote it.